Don Henderson and Doug Miles on Sports Talk. Topics include: Charlie Strong coming to USF, other college coaching moves, Army/Navy game, NFL Week 14, baseball, hockey and more. Guest: Sports Talk Host Rich “Spitz” Spedaliere”. Sports Talk with Don Henderson and Doug Miles guest Sarasota Herald Tribune Sports Columnist Doug Fernandes. (Tampa, FL) Quinton Flowers and Marlon Mack combined for over 300 yards rushing and 4 touchdowns to lead the USF Bulls to a 48-31 victory over UCF Saturday afternoon at Raymond James Stadium in Tampa, FL. The Bulls notched a program record 10th win and 7th in the American Athletic Conference. The Bulls overcame a 7-0 early deficit to their cross-I4 rival UCF Knights (6-6, 4-4) when running back Marlon Mack broke a tackle and scampered down the sideline 43 yards to tie the game at 7-7. Juwuan Brown gave the Bulls a lead they would never relinquish when he picked up a Jawon Hamilton fumble at the UCF 22-yard line and rumbled in for the score putting USF up 14-7 late in the first quarter. Marlon Mack tallied his second touchdown of the game on a spectacular 56-yard run, breaking at least four tackles on the way to the end zone. Mack would finish the day with 155 yards on 20 carries. The Bulls took a 24-14 lead into halftime. Quarterback Quinton Flowers opened the third quarter in style with a 62-yard touchdown romp, breaking teammate Marlon Mack’s single season rushing he set last year of over 1600 yards. Flowers had 152 yard rushing on 20 carries. He also completed 17 of 26 passes for 152 yards. UCF would pull to within seven points late in the third quarter, but USF linebacker Auggie Sanchez’ interception led to Flowers second running touchdown of the game and the Bulls never looked back. Head Coach Willie Taggart’s post game comments are available in the attached video below. Temple defeated East Carolina Saturday night to win the east division in the AAC and will play Navy in the conference champtionship game next Saturday at noon in Annapolis. USF will await bowl offers to determine where they will play next. USF honored 18 seniors today playing in their final home game. Six members of the senior class were recruited from the Tampa Bay area. Today’s win was the 10th of the season for USF, setting a record for the Bulls football program. USF’s road win last week over SMU was a school’s best 4th of the season. Coming into today’s game, the Bulls have a nation-leading streak of 15 games scoring at least 30 points. The Bulls offense has the nation’s 7th ranked total offense averaging 516.2 yards per game and 43.2 points per game. The Bulls average 286.4 yards rushing per game, good for 6th in the nation. USF beat UCF 44-4 last season in Orlando, FL. USF needed a Temple loss tonight to East Carolina to earn a spot in next Saturday’s (12/3) AAC Conference Championship game to be played in Raymond James Stadium in Tampa. Temple’s win over East Carolina Saturday night sets up the conference title game between Temple and Navy in Annapolis. ABC or ESPN will televise the game beginning at noon ET. Uniform Shuffle: The Bulls wore their all green uniforms with gold numbers, green helmets with gold Bulls logo. Today’s game was broadcast nationally on CBS Sports Network. 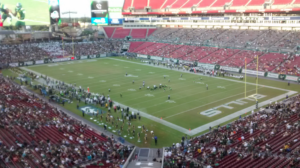 (Tampa, FL) The USF Bulls extended their American Athletic Conference winning streak to six straight wins with a 38-22 victory over the East Carolina University Pirates Saturday afternoon at Raymond James Stadium in Tampa, FL. Marlon Mack rushed for 152 yards and 2 touchdowns and Quarterback Quinton Flowers ran for 115 yards and threw for 250 yards and 3 touchdowns to lead the Bulls offense. “It wasn’t pretty”, said Bulls Head Coach Willie Taggart, “but I’m happy with the win”. Taggart’s high-powered offense racked up 556 yards, including 306 on the ground as USF (5-1, 2-0) remained unbeaten in conference play. ECU (2-4, 0-2) took the early 3-0 lead on their opening possession with a 40-yard field goal by Davis Plowman at 5:29 of the first quarter. After a stalled first drive, USF scored the second time they had the ball when Quinton Flowers threw a 6-yard touchdown pass to D’Ernest Johnson, capping off a 45-yard in 5:11 to go ahead 7-3. Both teams traded field goals early in the second quarter. Eric Nadelman booted a 26-yard field goal for USF and Davis Plowman connected on a 49-yarder to pull the Pirates within 10-6. Marlon Mack had his longest run of the season, 63 yards to the ECU 6-yard line, but fumbled on the next play and the Pirates recovered. ECU drove the ball downfield and Davis Plowman clanked it off the right goal post on a 42-yard field goal attempt. The Bulls mounted one of their patented quick scoring drives in less than two minutes, when Quinton Flowers hit D’Ernest Johnson for his second touchdown pass of the game from the 11-yard line giving the Bulls a 17-6 lead at the half. Marlon Mack scored on a one-yard plunge early in the third quarter to extend the Bulls lead to 24-6. ECU replaced starting quarterback Philip Nelson with sophomore Gardner Minshew (21-33 220 yards, 1 TD) who gave the Pirates offense a boost with a 1-yard touchdown toss to Zay Jones to make it 24-13. Jones was the leading receiver for the Pirates with 145 yards on 18 catches. Davis Plowman made it a one-possession game (24-16) with a 31-yard field goal early in the 4th quarter. Then after USF went 3 and out and punted, the Pirates drove 69 yards and scored on James Summers 3-yard touchdown run. Summers finished with 114 yards on 18 carries. The 2-point conversion was no good. USF led 24-22 with 6:58 remaining in the game. Quinton Flowers ended any hopes of an ECU comeback with his third touchdown pass of the game, a 62-yard strike to Rodney Adams over the middle to extend the Bulls lead to 31-22. Marlon Mack added one more score to the books on a 9-yard run lifting the Bulls to their fifth win of the season. USF will host UConn next Saturday (October 15) at Raymond James Stadium. Kickoff is scheduled for 7PM. Today’s victory extends the Bulls AAC Conference win streak to six straight, the longest in Bulls football history. USF holds a 5-1 all-time record over East Carolina. The Bulls defeated the Pirates 22-17 last season in Greenville, NC. USF defeated ECU in the 2006 PapaJohns.com bowl. Including today’s win over ECU, the Bulls have scored at least 35 points in ten consecutive games. The Bulls rushed for more than 200 yards against ECU to extend that streak to 11 games. The Bulls are first in the AAC and fifth in the nation in scoring averaging 45.8 points per game. Last week against Cincinnati, Marlon Mack had his 15th 100-yard game and became USF’s all-time leading rusher with 2755 yards in just 28 games. Today’s game marked his 16th straight 100- yard game. Today’s game was telecast nationally on ESPNews. Uniform shuffle: USF wore green jerseys with gold numbers, white pants and metallic gold helmets today. Lee Roy Selmon family members served as honorary captains at today’s game. Today was Homecoming for USF Bulls alumni. Next week: The Bulls are home to play UConn in another AAC conference game. Kickoff scheduled for 7PM. (Tampa, FL) When Quinton Flowers connected with Rodney Adams on an 84 yard touchdown pass just 17 seconds into the game, the Bulls looked like they would be another Louisville to Florida State. That vision ended 12 seconds later when Dalvin Cook raced 75 yards down the sideline on FSU’s first play from scrimmage to tie the game. The ‘Noles would tally touchdowns on its first 4 possessions en route to a 55-35 victory over USF in Tampa Saturday afternoon. Both teams traded touchdowns in the first 5 minutes and the game was tied at 14. Then the ‘Noles, coming off a 63-20 shellacking by Louisville last week, hit the gas pedal and jumped out to a 38-14 lead by the half. Dalvin Cook had another career game against the Bulls, leading all rushers with 267 yards on 28 carries and two touchdowns. Quarterback Deondre Francois added 75 yards of his own on the ground in a game that totaled 768 yards rushing between the two teams and 1097 total yards of offense. USF Quarterback Quinton Flowers led USF with 159 yards running the ball, while Marlon Mack was held to just 42 yards on the ground despite scoring one touchdown. The Bulls (3-1) winning streak ends at 3 while FSU (3-1) gets back on track after the Louisville loss last Saturday. USF begins its AAC Conference schedule next Saturday night at Cincinnati in a 7PM kickoff (ESPN2/ESPNU). Last Saturday’s comeback win over Syracuse put USF at 3-0 for the first time since 2011. The Bulls have won 10 of their last 12 games equaling the best period in school history. USF’s 48.1 points per game over the last 7 contests ranks the Bulls 2nd in the nation. Coming into today’s game, the Bulls are seventh in the country in scoring. Home cooking: The Bulls have won 7 of their last 8 at Raymond James Stadium, all by 3 touchdowns or more. American Athletic Conference Commissioner Mike Aresco spoke with the media in the press box before today’s game. He said he’s not concerned about several teams in the AAC, USF included, that have been making overtures to move to the Big 12 and other Power 5 conferences. He said the AAC has plans in place in case several teams leave the conference. FSU Seminoles and Tampa Bay Bucs play-by-play broadcaster Gene Deckerhoff has a much easier travel schedule this weekend. He called the ‘Noles/Bulls game this afternoon and will call the Rams/Bucs game tomorrow at 4PM from Raymond James. FSU is 2-1 all-time against USF. The last time the ‘Noles were in Tampa in 2012, they defeated the Bulls 30-17 before a school record crowd of 69,383 at Raymond James Stadium. Uniform shuffle: The Bulls wore their green jerseys with gold numbers, white pants, white helmets with gold bull logo this afternoon. Local connection: FSU QB Deondre Francois played high school football at IMG Academy in Bradenton, FL. (Tampa, FL) The USF “Gulf Coast” offense put on another great show with a dominant performance for Willie Taggart’s Bulls in a 48-17 blowout victory over Northern Illinois University Saturday night at Raymond James Stadium. Quinton Flowers threw four touchdown passes and 350 yards while Darius Tice rushed for 120 yards in 19 carries and a touchdown leading the Bulls to its first 2-0 start since 2012. Marlon Mack, the Bulls leading rusher did not play due to a concussion he suffered in last week’s win over Towson. Mack’s absence, though missed, did not slow down a relentless, no huddle Bulls offense that racked up 662 yards in total offense against the Huskies. The Bulls scored on its second possession of the game when Rodney Adams scampered into the end zone from 11 yards out capping off a 10-play, 80-yard drive. After an NIU 3 and out, Quinton Flowers connected with Ryeshene Bronson in stride down the sideline for a 73-yard touchdown in a speedy, 3-play, 84-yard drive in 1:15 to put the Bulls ahead 14-0. It was Flowers longest touchdown pass so far of his career. After a 31-yard Emilio Nadelman field goal early in the second quarter, the Bulls quarterback fired a 26-yard strike to Rodney Adams wrapping up another patented Bulls lightning quick 74-yard scoring drive in 2:06 opening a 24-0 lead over the shell-shocked Huskies. Emilio Nadelman added another field goal from 36 yards ending an impressive first half of offensive football for the Bulls who racked up 370 yards of total offense in the first 30 minutes. Quinton Flowers added touchdown passes of 13 yards to D’Erne Johnson and 6 yards to Chris Barr in the second half to equal his career high. Darius Tice topped a fine rushing night with a 13-yard touchdown run for the Bulls 6th end zone appearance of the game. Ryeshene Bronson led all USF receivers with 113 yards and a touchdown. The Bulls hit the road for the first time in 2016 next Saturday in upstate New York against Syracuse. Kick-off is scheduled for 3:30 PM. Coming into tonight, the Bulls had won 6 of their last 7 home games at Raymond James Stadium, averaging 45 points per game. Sarasota’s Marlon Mack who is 252 yards away from breaking the all-time USF rushing record, did not play due to concussion suffered in last week’s game against Towson. Tonight’s win against NIU gave the Bulls a 2-0 mark to start the season for the first time under Head Coach Willie Taggart. The last time USF started 2-0 was 2012. USF and NIU last played each other in the 2009 International Bowl in Toronto, Canada, which the Bulls won 27-3. The Bulls defeated NIU 37-6, in 2002 here in Tampa. NIU beat USF, 20-17 in DeKalb, Illinois in the school’s first meeting in 2001. The Bulls are not scheduled to play NIU on the road until 2025. The last time NIU played a game in Florida was October 9, 2004 in Orlando against UCF. Tonight’s game was televised nationally on the CBS Sports Network. The Bulls wore their all green uniforms with gold numbers and gold helmets with the green Bulls logo tonight. 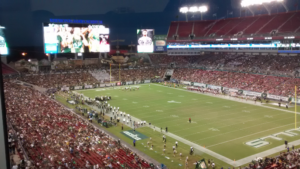 (Tampa, FL) The 20th season of USF football began with a roar as the Bulls soundly defeated the Towson Tigers 56-20 Saturday night at Raymond James Stadium in Tampa, FL. Head Coach Willie Taggart in his 4th season at the helm of the Bulls watched his high octane, no-huddle offense roll over the Tigers defense in the season lid lifter. USF jumped ahead quickly 1:39 into the game when Quinton Flowers zipped a pass to Darius Tice who eluded several defenders and rumbled into the end zone from 43 yards out capping off a speedy 6-play, 80-yard drive. Marlon Mack tallied the Bulls second score with a 7-yard touchdown run set up by a 57-yard kickoff return after a Towson field goal to make it 14-3. Mack would later leave the game after a hard hit which caused a fumble early in the second quarter. He walked off the field on his own power but would not return to the game. Quinton Flowers tossed his second touchdown pass of the game a 51-yarder to Marquez Valdes-Scantling at the 6:56 mark of the second quarter and then ran one in from 5 yards out on the Bulls next possession to put USF ahead 28-10 at the half. The Bulls quarterback added another rushing touchdown midway through the 3rd quarter before leaving the game to his backup Brett Kean, who threw 2 touchdowns of his own. Flowers completed 8 of 18 for 178 yards with 2 touchdowns, 1 interception and 58 yards on the ground. Kean went 5 for 7 with 2 touchdowns. Marlon Mack rushed 9 times for 58 yards and 1 touchdown. Darius Victor led all runners with 78 yards on 23 carries and 2 scores for Towson. Tiger quarterback Morgan Mahalak completed 16 of 36 with no touchdowns and 1 interception. USF hosts Northern Illinois next Saturday night at Raymond James in a 7PM kickoff before heading to Syracuse the following week. Tonight’s game marked the start of the 20th season of USF Bulls football and 17th at the FBS level. Coming into tonight, the Bulls were 14-5 in season openers and 18-1 in home lid lifters. Former Booker Tornado (Sarasota) high school standout Marlon Mack who was the offensive juggernaut for the Bulls on the ground last season brought a streak of 5 straight 100-yard games into tonight’s contest against Towson. Mack led the AAC in rushing for the second straight season last year averaging 115 yards per game, 1381 overall. He has 2422 career rushing yards, 309 away from setting a new school record. WR Rodney Adams set a USF record with 822 receiving yards last season. Junior quarterback Quinton Flowers returns as the Bulls field general. Flowers tossed 22 touchdowns in 2015 and ran for 12. USF has been picked by many to win the East Division of the American Athletic Conference. In addition to the USF radio network, tonight’s game was broadcast nationally on the American Sports Network and ESPN 3. This was the first meeting between the two schools. Former Manatee Hurricane Willie Taggart enters his fourth season as head coach of the Bulls and seventh overall. The Bulls were 8-5 overall and 6-2 in the AAC in 2015. 15 starters return to the Bulls lineup this season from last year. The Bulls are 126-101 overall in their 19 year history and 106-88 in the FBS. USF has a 4-3 record in bowl games. The Bulls wore all green uniforms, green helmets with fluorescent yellow numbers tonight. This was the first game ever for the Towson Tigers in the state of Florida. Earlier today in the AAC, #15 Houston upset #3 Oklahoma 33-23. The Bulls host Northern Illinois next Saturday (Sept. 10) at Raymond James 7PM EDT.